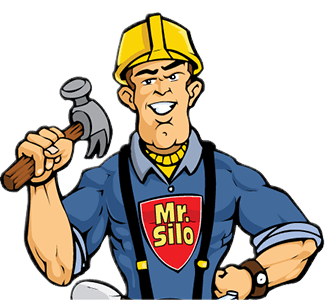 Does your concrete silo roof leak? Issue: Does your concrete silo roof leak? When selecting a roof covering for a concrete silo, it is critical to select a coating that adheres directly to concrete, rather than a roof cover that merely conceals the concrete roof and future issues. Pictured above is a typical, membrane covered concrete silo roof. The photograph shows the beginning of the roof preparation by removing the old membrane cover. As shown by the light gray areas remaining, the membrane cover has become very brittle, cracks easily and can be scraped right off the concrete roof because it merely covered the roof. Membrane covers do not adhere directly to concrete silo roofs. Pictured to the right is the same concrete silo roof from a different angle. The photograph shows the silo roof with the base coat that was applied directly to the concrete silo roof. The base coat is also known as a filler because it adheres directly to the concrete roof and fills in small cracks or holes that could otherwise lead to water penetration or roof failure. High coating elasticity (up to 500%) and direct, complete adhesion to the concrete roof eliminates water intrusion. Because our coating bonds directly to the concrete, if the concrete cracks, the water cannot migrate under the coating. The white colored material shown on the base coat is used with a mesh material to fill in larger cracks or holes in the silo roof. The base coat even adheres to metal frames or penetrations when the surface is prepared correctly. Lastly, these silos were completely coated with a rubberized top coat that adheres directly to the base material and adds durability to the roof coating. A variety of colors are available when selecting the top coating for your prospective silos. This is a proven industrial roof coating system that keeps the elements out and stored materials dry. It can be utilized on metal or concrete roofs.